It’s the season to love your brassicas. No it’s not a dirty word, it’s a family of vegetables. Included in these are the brussels sprout and this is what I did with some this week. Brassicas are a fantastic family of vegetables and if you’d like to learn loads about them then click here. Lets not fuss about though, you either love or hate brussels sprouts and according to the link above, that relationship is down to your genes. All I know is that I ruddy love these little green snotballs as they are affectionately referred to in our family. All of us do. Come Christmas Day when we were growing up Mam & Dad struggled to keep enough on the table to satisfy myself and my siblings. It can be hard to judge when sprouts are cooked just right and you can end up with either hard, impenetrable little bullets or balls of slush that have been overboiled. Prepare your sprouts by trimming the ends and peeling off the outer leaves until you’re left with pale green, firm brussels sprouts. Then cut a small “x” or cross into the bottom of each one. Some people argue that it makes no difference to the cooking but it’s something we’ve always done in our family so I’m happy to continue the tradition. 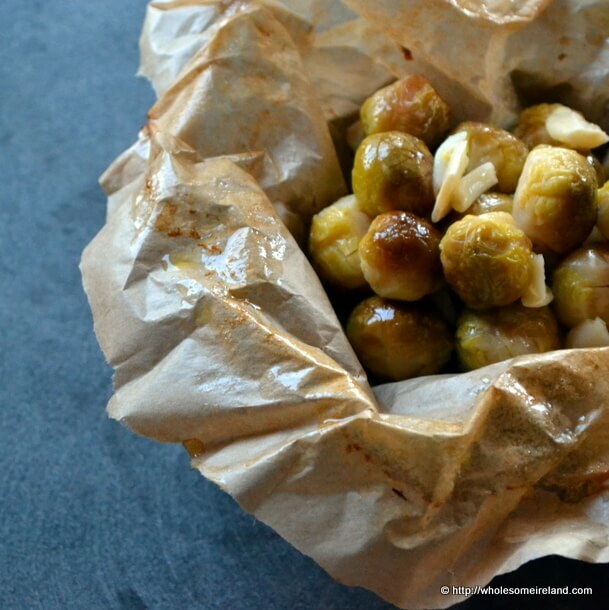 Try braising your sprouts (a net bag of about 250g) in 100ml of water and 50g (I know I know artery clogging) of butter with 3 shaved garlic cloves interspersed between them in a shallow baking dish, covered in greaseproof paper. Pop your dish into a warm fan oven of about 125 degrees Celcius for at least 1 hour. Check the edges of the dish often in case you need to top up with a dribble of water to prevent them from drying out. For extra flavour use ham water instead of regular tap water for the braising liquid. On Christmas Day, once the oven is turned off and your bird is resting you could pop a dish of prepared sprouts into the base of the oven to braise in the residual heat. This is a great idea if you have an Aga or similar. Serve by tipping the dish upside down so that the sprouts nestle in the paper that covered them during cooking, season and sprinkle with slivers of freshly cut hot chilli if you dare or perhaps even some torn preserved lemons. I like cooking sprouts this way because braising sweetens them Veru. You can always make less for yourself and more again the following day! These sound delicious! I’m a late convert to Brussels sprouts (we never once had them when I was growing up) so I’m making up for lost time. I guess they could be an acquired taste but I love them all year around. Did you know that there is a native sprout plant that’s originally from the area of my town? I hope to grow them next year! These look great, Caítríona. 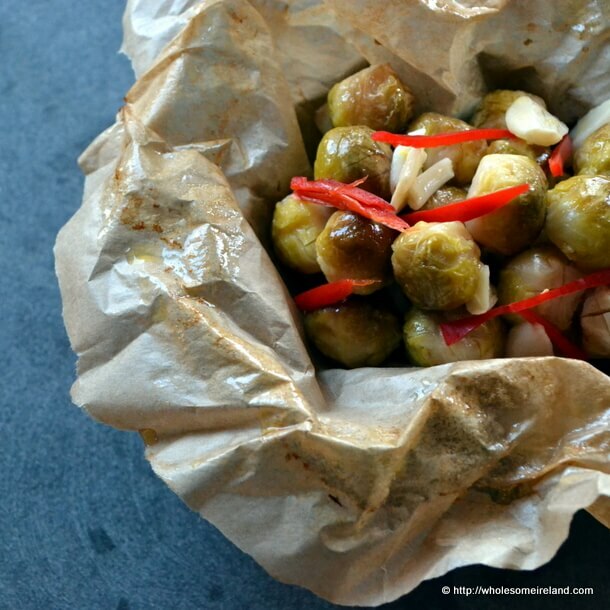 I became a Brussels sprouts convert when I started traveling to Ireland. They are well and truly loved there. Will have to share my favorite way to prepare them soon. Enjoy! Thanks Elizabeth, do please share your recipe!